Good grooming is essential to ensure your cat or kitten has a healthy coat and skin. Cats are very clean animals so they will groom themselves regularly - but they also need the help of their owners to keep them in tip-top condition. Grooming can range from simply brushing your cat once a week and regularly trimming its nails - to a more thorough program involving bathing and drying, de-tangling, brushing, combing and shaving. 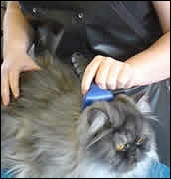 Grooming can sometimes be hard work, but most cat owners enjoy the rewards of keeping their pets in good shape. There are of course plenty all of professional grooming services available - but as you would expect, they come at a price. Failure to trim your cats nails, and eventually lead its feet becoming deformed with the nails even growing back into the pads, causing considerable pain - so clearly nail trimming is very important for your cat's well-being and health. Toenail trimming involves pushing on the top of the total to extend the nail and then putting off the hooked end with pet nail trimmers. However, it's very important to avoid touching the quick - the group of blood vessels and nerves which supplied the nail. If you accidentally do this, your cat will experience pain and the toenail will start to bleed. The quick can be recognized as a pink line or triangle inside the normal white nail. You should familiarize your pet nail trimming when is a kitten and you should start by cutting small amounts of nail until you gain confidence. Vets are normally quite happy to demonstrate the procedure to you. Some cats like water, but they are greatly outnumbered by those who don't! Some cats may never need a bath but others will when circumstances dictate - this could be when fleas are present, your cat's coat is greasy or dirty, or there is discoloration or a smell from your cat. You must use a formulated pet shampoo and not any of the products used by humans, as they do not have the right pH balance for your pet's skin. Before bathing you should comb out any matted hair as this will become tight and difficult to remove when wet. Start the bathing procedure by placing a mat or towel on the base of the tub to prevent your pet from sliding. Then, using a sprayer attachment on your tap, wet your cat's coat with warm water, and if necessary, hold your pet by its scruff. Massage the shampoo into the coat, rubbing away from the head and clean your cat's face with a soft toothbrush with lather on it. If you accidentally get shampoo in your cat's eyes rinse them with saline solution from a bottle. After soaking for a few minutes, rinse your pet with warm water, and squeeze away excess water from the whole body. Finally towel dry your cat and then use a hair dryer on low or medium setting to dry the coat, brushing or combing throughout.